Have you wondered about your chances of getting a fungal infection? Here are 10 questions you can use to understand fungal infections, learn how you can get sick, and know what you need to do to stay healthy. Fungi are everywhere. There are millions of different species of fungi on Earth, but only about 300 of those are known to make people sick. Fungal infections are often caused by microscopic fungi that are common in the environment. Fungi live outdoors in soil and on plants and trees as well as on many indoor surfaces and on human skin. Mild fungal skin infections can look like a rash and are very common. For example, ringworm is a skin infection that’s caused by a fungus, not a worm! Fungal infections in the lungs can be more serious and often cause symptoms that are similar to other illnesses, such as the flu or tuberculosis. Fungal meningitis and bloodstream infections are less common than skin and lung infections but can be life-threatening. Because the symptoms of fungal infections can be similar to other illnesses, proper diagnosis and treatment are often delayed. The more you know about fungal infections and your chances of getting one, the better prepared you can be to protect your health. 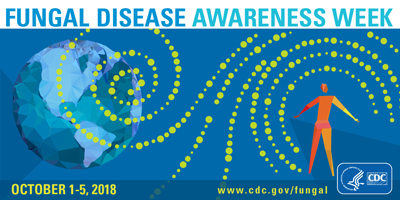 Join CDC in sharing information to increase awareness in your community about fungal diseases during Fungal Disease Awareness Week, October 1-5, 2018. Anyone can get a fungal infection. You can learn more about the signs, symptoms, and treatment of fungal infections and get prevention tips by visiting CDC’s fungal diseases website and by talking with your healthcare provider.